Archaeologists discovered two new corridors in a 1,700-year-old Roman-era temple belonging to the Mithras religion as part of the excavations conducted in the Zerzevan Castle in southeastern Diyarbakır province. 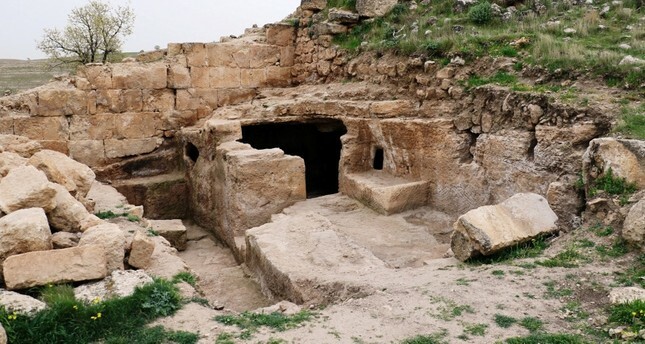 The head of the excavations, assistant professor Aytaç Coşkun, a faculty member of the Department of Archaeology at Dicle University, said the corridors were discovered as underground passways to the Mithras temple. "This temple's rituals were conducted in secret and only people which met certain criteria were accepted to the religion," Coşkun said. The assistant professor said the Zerzevan Castle will soon become the most important touristic attraction in Diyarbakır and they have set the target number of tourists at 1 million for Diyarbakır and 600,000 for the Castle in the upcoming season. According to the findings, the followers of Mithras religion were a closed community because their religious ceremonies are completely secret and no information was leaked to outsiders. "Their temples are usually built underground. There are three niches on the eastern part of the temple. A very thoroughly constructed one is in the water basin. There is also a pool. We believe water was very widely used in Mithras ceremonies and about 40 people attended ceremonies held here," Coşkun said. With the arrival of Christianity, the religion of Mithras lost its importance and the recently discovered temple is from the peak times of this religion. The Zerzevan Castle is situated along the ancient route of military premises and located on a 124-meter-high rocky hill in a strategic location between Amida and Dara. The settlement overlooks the entire valley and once controlled a large area on a key, ancient trade path. Once a strategic Roman border garrison town, the castle also witnessed the clashes between Romans and Sassanians. The first settlement was named "Samachi" and while it is not certain when it was built, the excavations are close to revealing its age. The castle walls were repaired at the time of Anastasios (491-518 A.D.) and Justinianos (527-565 A.D.) and some parts have been completely reconstructed.